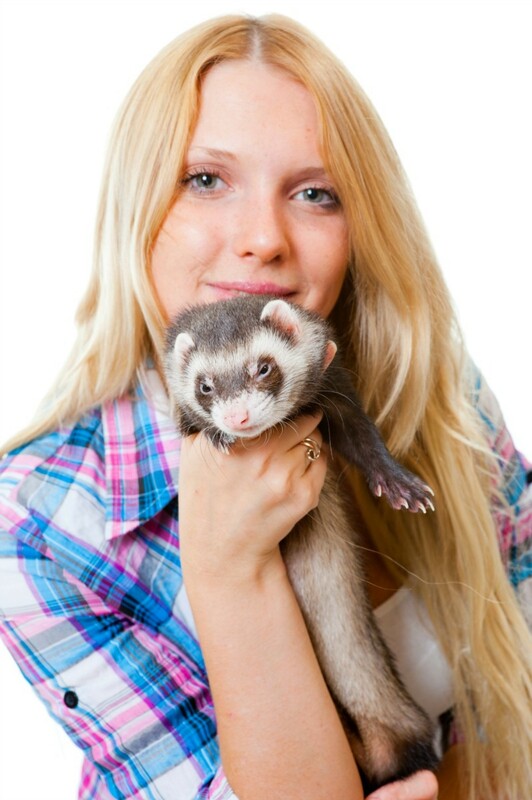 Pet ferrets are related to the domestic European ferrets that historically have been used to keep rodent populations down and to hunt rabbits. They are noted by some sources as the third most popular uncaged pet after the dog and cat. This is a guide about ferret information and photos. Scooter is a 7+ year old ferret. I adopted him from someone who couldn't keep him any longer. Scooter snuggles, cuddles, runs around room carrying his "babies" to safety even though he is totally blind! Ferrets can be the sweetest little, friendly critters as pets. They share their food dishes with other ferrets or even the family cat and are real lovers. Her name is Where's the Weasel? LOL! She is 1 and a half years old. She is a Marshall Farms Ferret we bought at Village Pets. 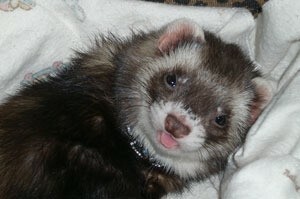 When President Obama sent out the stimulus checks, then my husband went out and bought him a ferret. I requested a ferret cage on freecycle.org and got one. We fixed it up really nice, and voila! A perfect little house for the ferret, although he is out about 5 times a day. He likes to do stunts to make people laugh, laugh back at people who laugh at it, and also eat its furrotone supplement. This seems to be its favorite time of the day when nothing else matters. LOL We wanted to name her Sugar but she never responded to that. Once we wanted to get her attention and when we said "Where's the Weasel?" She came running out from under the bed. The name has been her own since that day. 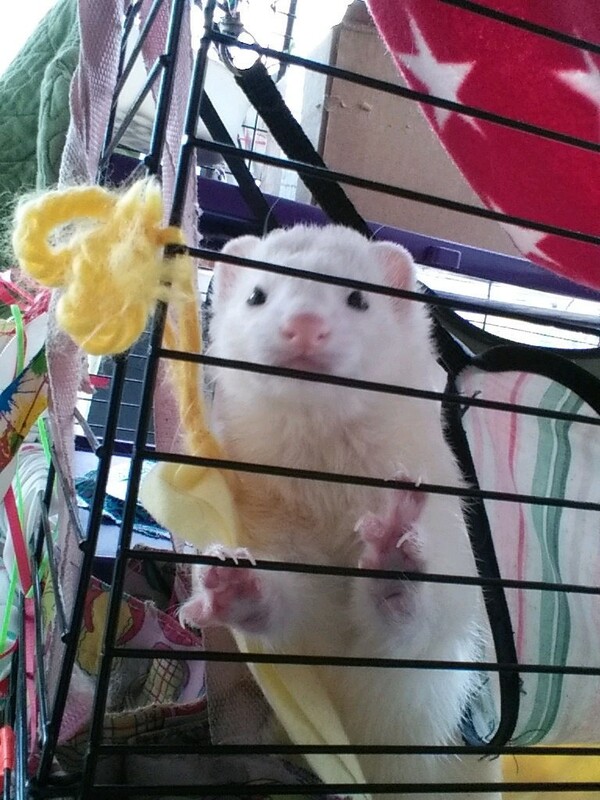 Tinker, the ferret is over 1 year old. We read on freecycle.org that someone was looking for a suitable home for a ferret. 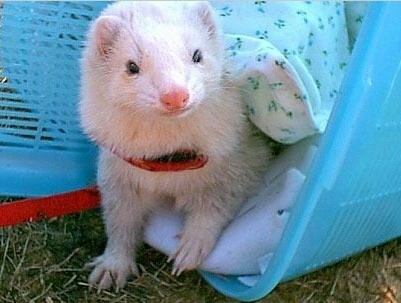 The person had taken it from someone else, who had found the ferret too hard to care for. We were chosen, so we went to get her. Tinker loves to play in water with her feet and jump. She play bites too hard, which we are working on, and she gives endless kisses. Chortling is an activity she likes to do. She does it so loud. We always startle when we hear it and wonder what it is at first. She is a joy and a sweetheart. She came to us with a lot of behavior issues, but she has gotten through all of them with flying colors. Tinker is so happy. At first, we thought she might be deaf, but it turned out she is not. She has a habit of stealing and stashing shoes, especially flip flops. She has the nickname "Shoe Monster." Tinker the ferret and Peanut are both about two years old so they really get along great! 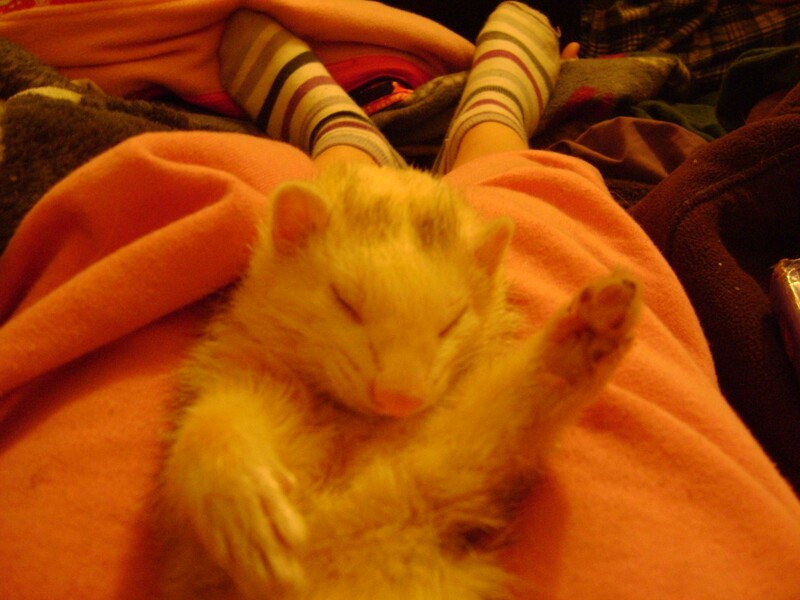 10 lessons I learned from my daughter's pet ferret. Moo Moo is a 1 year old Sable Ferret. My girlfriend and I went shopping at Target and stopped at a pet store on the way out. Moo Moo was the biggest and oldest ferret in the glass box he lived for 9 months. He kept getting picked over and I felt so sorry for him. 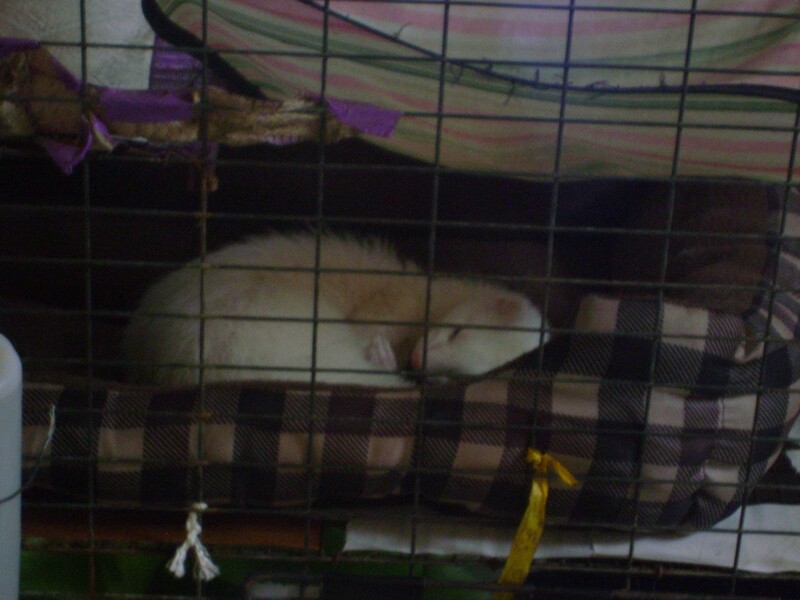 Our female ferret, Tinkerbell, is resting in a dog bed we put in her cage. Ferrets love to snuggle! Theodore is a real rascal; he loves to chase dogs, knock things over "just to see what happens" when they land, and wrestle my two other male ferrets and one female ferret.